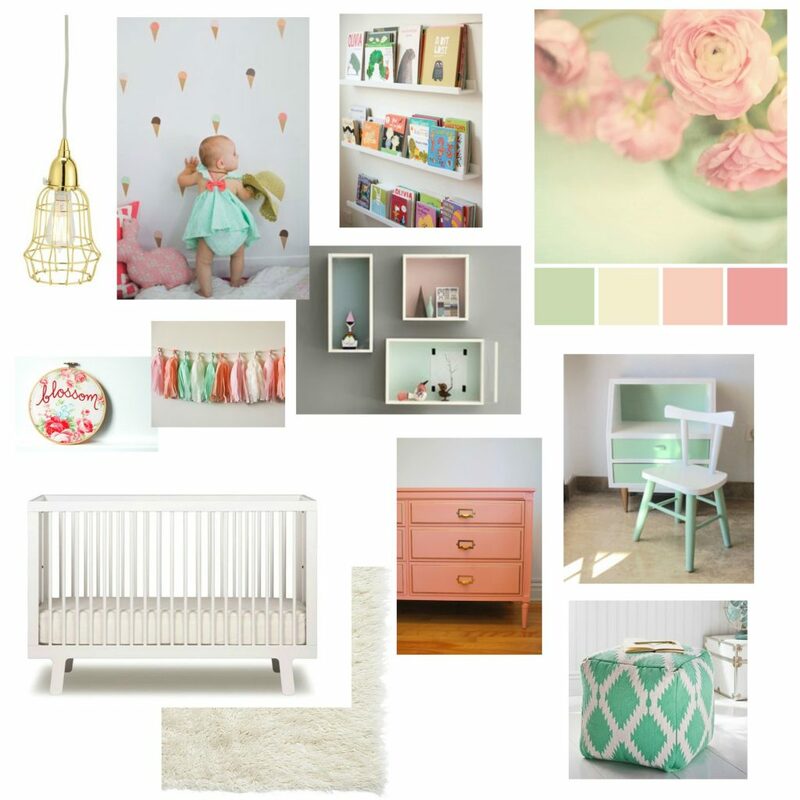 Last week you saw the pink and mint nursery moodboard for Maya and the items I was keeping and nixing from her first room. 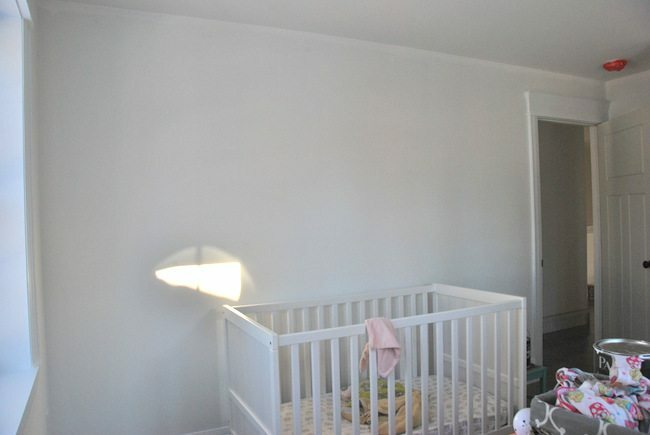 Let’s dive in next – how to create an accent wall in a nursery. 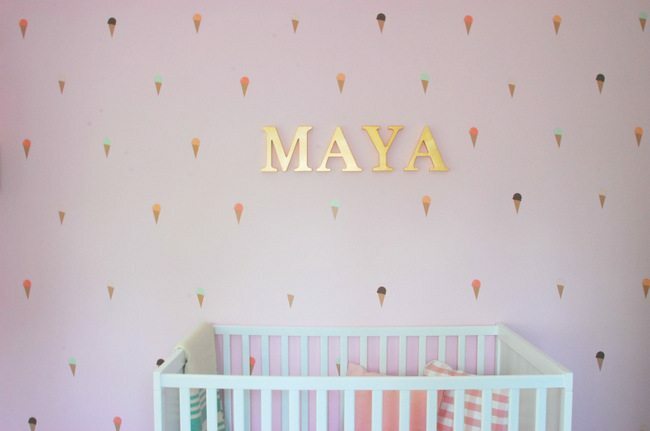 We’re talking pink and ice cream cone decals, folks. Holla! Before any of the fun stuff, I first needed to get the room painted. I LOVE myself some white walls with fun bright colours in accents, so I got to work painting the trim, baseboard and walls in a bright white – PARA Paint’s “Whitewash White” – using an eggshell finish for the walls and PARA’s door & trim paint for the trim. It’s a really cool, bright white, which works in this space because we have two windows which let in tons of natural light. 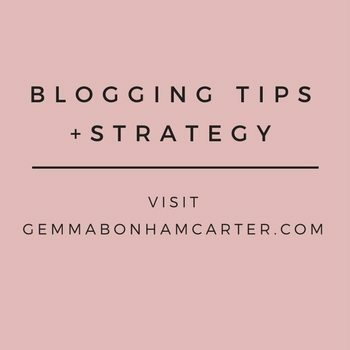 Did you catch Emily Henderson’s post recently about when NOT to paint walls white? If not, you should check it out. It totally makes sense. 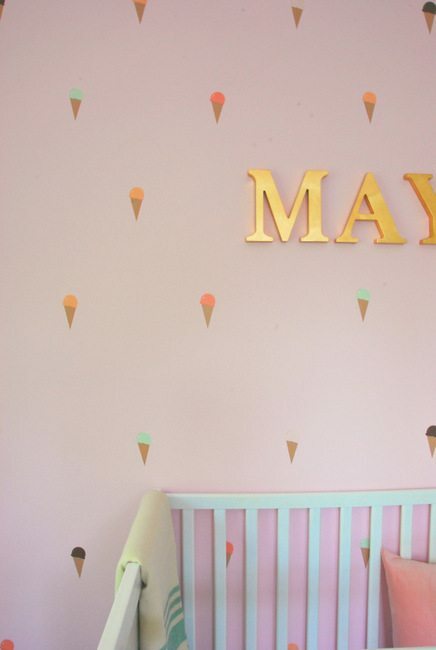 Remember those ice cream decals from the moodboard? 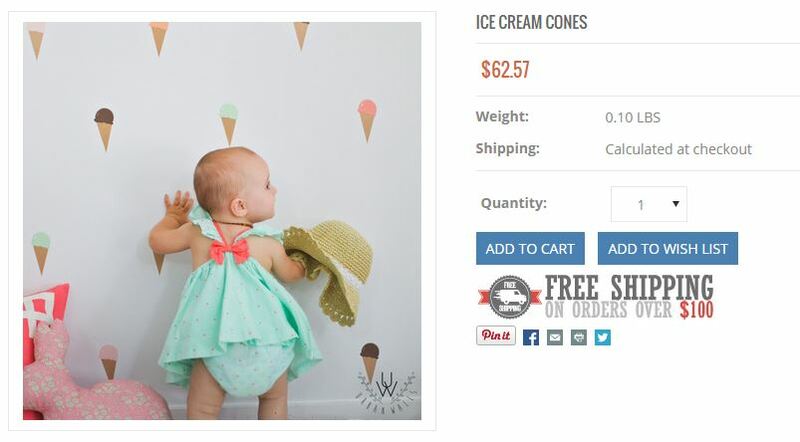 Well, I spotted them through my fave decals source, Urban Walls, and barely paused before I hit the purchase button. Seriously, how cute are they? I could die. 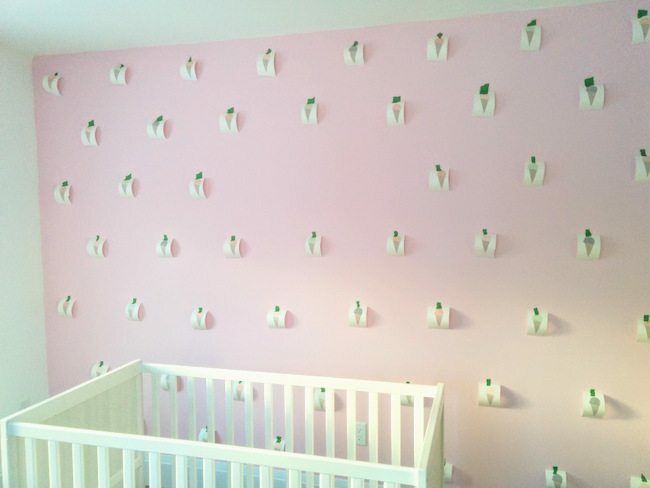 I have used Urban Walls products in past projects (like their big heart in this client’s nursery) and not only are the designs amazing, but the product is easy to use, good quality, and affordable. 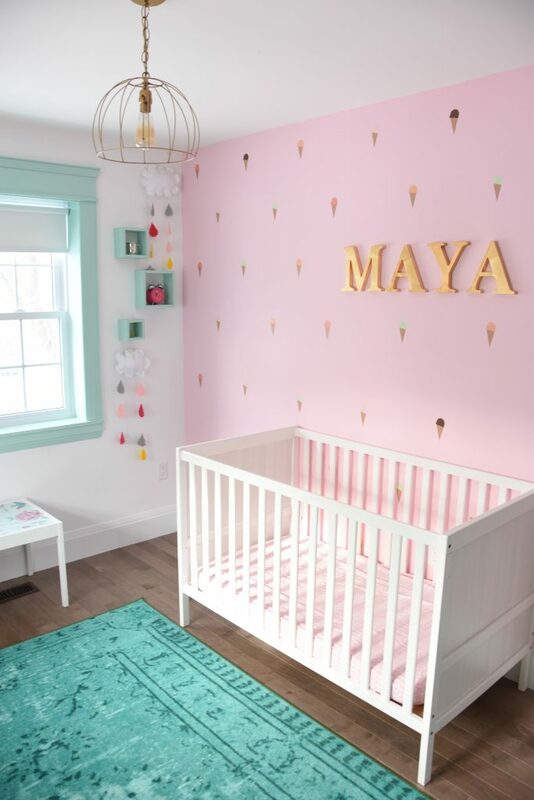 Originally my plan had been to put the decals straight onto the white wall where Maya’s crib (and eventually bed) will go, but I had a sudden urge to throw some pink on that side of the room to balance out the pink dresser, which I knew would be on the other side. So, out came PARA Paint’s “Flushed”. 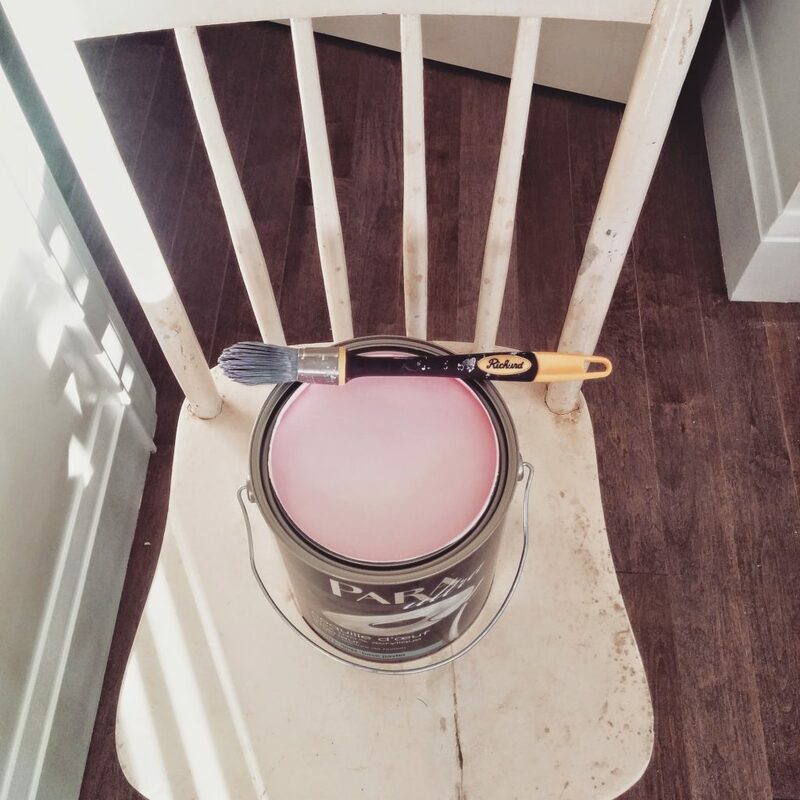 This colour isn’t for the faint of heart – it’s a full on pink. And I love it. Decals time. They are individual rather than sheets, so you can choose exactly how you want your spacing to look like. I did a quick count of how many I had, and then calculated out how many rows it would give me with about a foot between each decal, and half a foot between each row. Once I had figured out that basic placement, I tapped up my decals using painter’s tape. I was able to step back and view it all, before going one by one and removing the backing and applying the decal to the wall. PS – the space in the middle of the wall will make more sense in a sec. I also kept the colour placement random, but made sure not to stick like 4 mint cones in a row. The result? SO FUN!!!! Oh my goodness I want to marry those decals. They are just the cutest. My only thought had been “what if I’m promoting unhealthy eating in my daughter?” which is so the health promotion academic in me speaking. Like maybe I should have gone for pineapples or watermelon (fruit!) instead? But I just loved the ice cream cones too much. I figured I was being ridiculous, and stuck with my sweet cones. See the M-A-Y-A letters up on the wall? I used those at her first birthday party (originally from Indigo, now sold out sadly). Well, my plan was always to use them in her room. I love the way the gold looks next to the pink, and plays into the gold light fixture, too. Hello, meant to be. Sidenote: That light fixture? 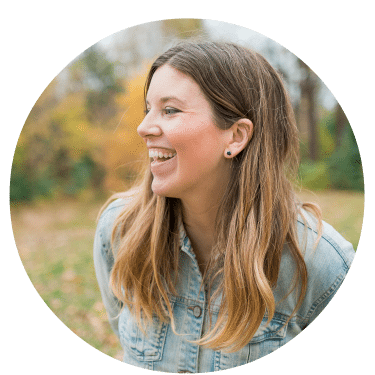 If you’ve been reading this blog for a while, you might remember it from the bungalow. It was the fixture I pulled out of the garbage, removed all the yarn (it was one of those hippy yarn-covered pendants, which can be cool… this one was not), and spray painted it black. 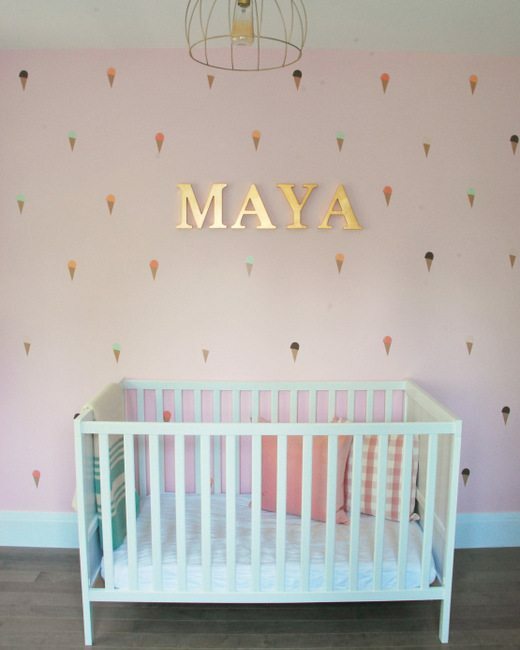 I gave it a new coat of gold for Maya’s room (my go to Krylon gold spray paint), and threw a vintage style bulb in. That $0 garbage fixture always gets lots of love from visitors (“oooh, where did you get the light fixture? I love it!”). So funny, hey? So there it is – A beautiful accent wall for a kids room! Pretty easy, eh? Update –> You can see the full nursery reveal here!! Have you guys used decals before? Into accent walls, or do you prefer to just carry a look through to all four walls? I know people can be divided on this. What else is going on? Any new news? Do tell.